A military team is testing the limits of a solar and battery-powered, street-legal golf cart by taking it on a 4,000 mile trip across America. The 10-person team made up mostly of Coasties is hoping to raise $50,000 for the Wounded Warrior Project. 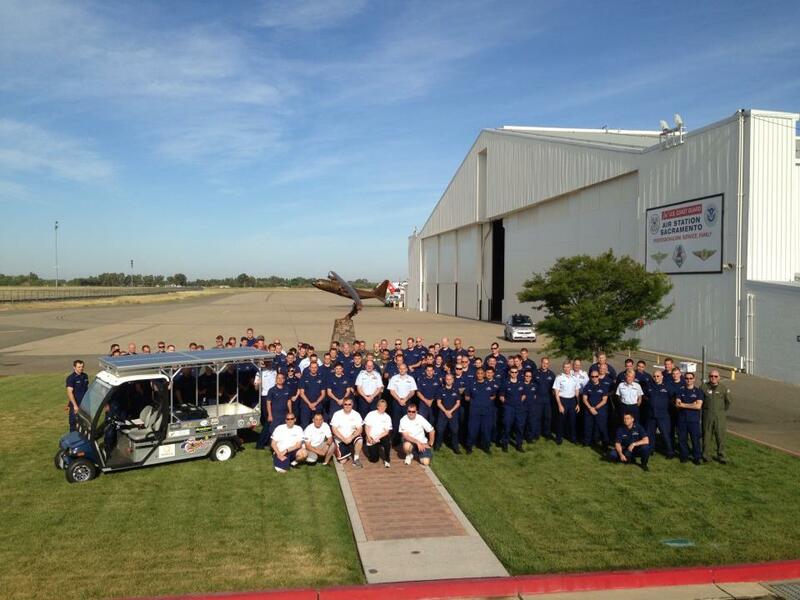 The team poses with Coasties from Coast Guard Air Station Sacramento during their trip. A ten-person team made up mostly of Coasties is taking turns driving an electrically powered golf cart across America on their off duty time to raise money for the Wounded Warriors Project. Carting for a Cause. The idea for the trip came to Chief Electrician’s Mate Ray Rehberg while on the job at Coast Guard Training Center Yorktown, Va.
“It was born in the classroom,” said Rehberg, who is an instructor at the training center. They were wondering how far they could actually drive a golf cart on battery power alone. But they have another important motive for the trip:stopping at local VFWs, American Legions, veteran hospitals and military bases to reconnect with the country’s veterans. Rehberg has been collecting veteran stories and posts them in a Captain’s log on the Carting for a Cause Facebook page. Listening to the stories, Rehberg said, has inspired him to get more involved with veterans in his own area. Rehberg said he has gotten teary-eyed when he hears war stories, or a World War II vet recite his service number by heart. Rehberg said the road trip in the golf cart has also allowed him to see the thriving American culture in the back roads of the country. “We had a lady bake us a pie … and it was good,” he said. The same lady also set out an American flag to greet the golf cart team. “There is a lot of goodness in America you are not seeing in TV,” he said. The team started their trek near the Chief Petty Officers Academy in Petaluma, Calif., on April 29, and are scheduled to end the trip on May 26 in Yorktown, Va. While the golf cart is rolling through all 4,000 miles, team members are switching on and off the mission as time allows. Before they get to Yorktown, Rehberg is trying to coordinate a stop at the White House. He said he’d love to park the Golf Cart in the White House lawn on May 24 to bring some attention to the cause. And Rehberg said the team can also accept donations at one of their scheduled stops across the country. So far, they are about a quarter of the way to meeting their goal of $50,000, he said.